Having the words Italian, one-off and handmade in the same sentence are never usually synonymous with affordability, and to be honest, we don't really have any idea the MSRP of the following items, and because we could not find any pricing info on them we'll have to assume they are expensive. However, that does not mean you can't appreciate and desire them, after all, everybody loves a Ferrari despite few ever getting the opportunity to own one. There is little more we can add here regarding Manoteca that the pictures don't already say in spades. 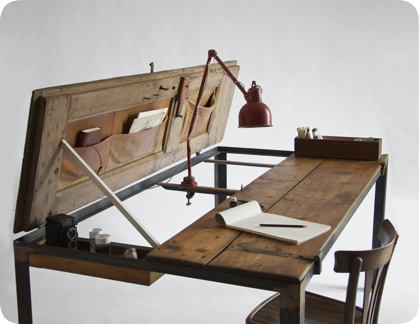 The "Indoor" desk (shown above) is and exercise in form following function, in that it can act as a desk and organizer when open, and a dining table when closed...and is devastatingly beautiful while being both. 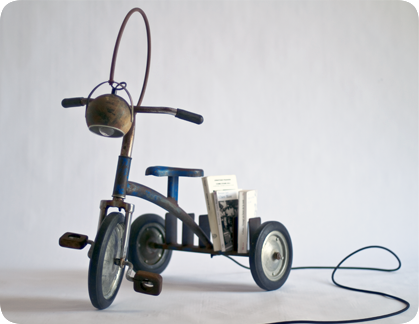 Hit the jump to see Manoteca's "Il Fausto" tricycle lamp and the "La Nuit De Noel" floor lamp. 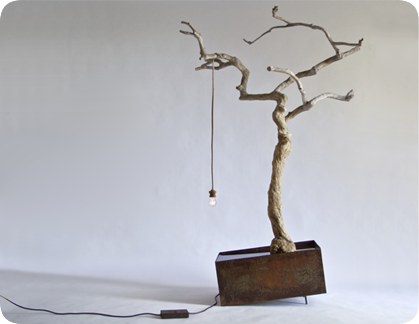 All beautiful, and original, and inspiring for one to turn a garage sale find into something unusual, functional and interesting. More info available here.